I love listening to music. Who doesn’t? Whether it’s rock, folk, or jazz, on the radio, a CD, or at a live venue, music is one of the great pleasures of life. I have massive respect for all of the talented musicians who perform and create content, whether that be on a global level or on small local stages. With talent, and a driving passion, these individuals bring auditory joy to their audiences. And now, with modern technology, there are so many new devices and apps that can make it even easier for them to share their music with the world. The iRig Acoustic mobile guitar mic, from 1K Multimedia, with the companion app, AmpliTube Acoustic, is one such product package. I’m not musically proficient myself, so for this review, I’ve enlisted the help of a professional musician, the incomparable Todd McCool. Todd is a very talented guitarist, based out of the Greater Los Angeles area, with years of experience, a prolific résumé, and a huge fan base. He’s also one of my favorite musicians to watch perform, especially when rocking an epic guitar solo. Among his numerous band affiliations, including Post Modern Jukebox, various past Disneyland shows, and an upcoming Six Flags Magic Mountain project, he plays regularly with a fantastic folk trio called Faultlines. Their star is steadily on the rise, as they consistently pack the house at popular venues all over the West Coast, including House of Blues, Gaslamp, and Gypsy Den. You can find links to the Faultlines official Facebook page, as well as Todd’s Facebook page and professional web site, at the bottom of this post. The following review is mostly Todd’s work, and he has my eternal gratitude for lending me his professional expertise. The iRig Acoustic, along with the AmpliTube Acoustic app, is an easy to set-up, easy to use audio interface for an acoustic guitar. 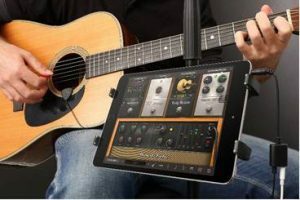 The iRig Acoustic is a small, mobile mic, shaped like a guitar pick, which clips unobtrusively to the sound hole of a guitar, positioned to replicate the perfect standard mic placement, and plugs into any iPad or iPhone. The accompanying AmpliTube Acoustic app allows you to record, alter, and edit the performances recorded through the mic. This package eliminates the need to spend hundreds of dollars on a more extensive suite of recording equipment, since you can do it all on your mobile device. This mic/app combo is a very handy tool for writing and creating demos, capturing rehearsals and live performances, and even making final, polished recordings. The mic itself (Retail $49.99) has surprisingly good sound quality, both crisp and clear, and warm at the same time. Due to the placement of the mic, and the uniquely designed mic enclosure, this device captures the pure, rich sound of an acoustic guitar’s full tonal characteristics, something usually requiring an expensive high-end studio mic. It picks up only a very small amount of ambient room noise, and only detects sounds of movement and vibrations when first settling into position, but none at all while actually playing, capturing a nice clean recording. The clamp design holds it firmly in place, without getting in the way of hand movement, and is made from soft, non-marring rubber, so the surface of your guitar will be protected from scratches. 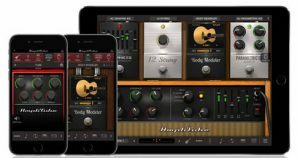 The app is very user friendly, with all the things a guitarist could want in order to get a great, natural acoustic guitar sound in the recording. It also has a variety of amplifier options and effects, like sound enhancing echoes, delay, flanger, reverb, gain adjustments, and feedback eliminator. The calibration process is super easy, and only takes about a minute, setting up your highest sound level to eliminate any peaks during recording, and giving you a good audio signal from the get go, and maintaining it throughout all aspects of the app. It has a great option of an 8-track setting, so you can record multiple parts individually, and combine them all to create a cool, full guitar orchestra by yourself. This all comes with the standard AmpliTube Acoustic app for $9.99, but there are even more recording and studio effect options if you purchase the additional features content for $19.99 extra. There’s even a free edition of the app, if you’d like to try it out before spending the money, though it only has very limited features. There are other recording software packages out there, and other affordable mics, but they don’t have the coolest element of the iRig Acoustic, which is the device clipping directly onto an acoustic instrument. This frees you up to focus on performing without being concerned about straying too far from a stationary mic’s sweet spot, and provides high-end quality sound capture at a fraction of the price. If you download the total recording package, this product is definitely worth the price, especially since it provides a complete audio interface and doesn’t require any more extensive equipment. If you’re in the market for a quality acoustic recording system, check out both the iRig Acoustic and AmpliTube Acoustic app. You can find the device on Amazon or on the 1K Multimedia site, where you can also learn all about the impressive technology inside the microphone. The app is available on iTunes. Once again, a heartfelt thank you to Todd McCool for his huge contribution to this review. Please check out all of his linked music pages below, and if you live on the West Coast, treat yourself to every opportunity to see him play.